• Jeremiah 30: 1-2, 12-15, 18-22. • Psalm 102: 16-21, 29, 22-23. …or, any lessons from the common of Holy Men and Women, or from the Common of Pastors for One Pastor. • II Timothy 2: 1-7. • II Corinthians 5: 10-15. • Acts 6: 8—7: 5, 47-60. 9:48 AM 8/2/2016 — When I was sick and had to spend a month confined to my rectory recovering from surgery, I took it upon myself to start writing a book: a life of Sir Arthur Conan Doyle combined with a review of all sixty of his Sherlock Holmes adventures; it will be published in January of next year. Working on it necessitated re-reading all the stories; and, as I did so, I began to see them with a more critical eye, and realized that Sherlock Holmes wasn’t as smart as I originally thought he was. After all, it’s no trick for a mystery writer like Doyle to make his detective seem brilliant when he’s made every other character in the story an idiot. Holmes always solves the case, but he does so amid an entourage of bumbling policemen and his own friend and biographer, Watson, who can’t seem to see the fog for the weather. And it occurs to me that I get that same feeling whenever I read this passage about our Lord walking on water and calming the sea. They’re all amazed at this feat; and it’s almost as if, up to this point, our Lord has given His disciples no indication that He is in any way Divine. Except that just prior to this, our Lord fed five thousand men on the hillside, not counting women and children. That’s a pretty good card trick. And it wasn’t the first time He had done that. You would think that, by this time, our Lord’s disciples would understand that this Jesus fellow is different, and that they shouldn't really expect to be surprised by anything. And that passage ends, you’ll recall, with our Lord sending His disciples in the boat to the other side of the lake, while He stays behind to pray. 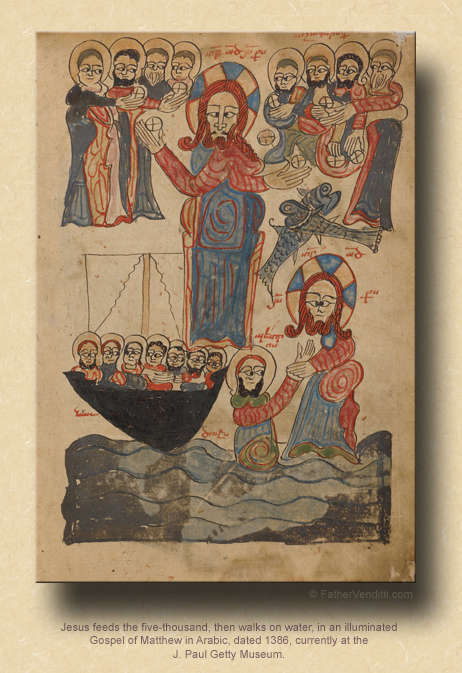 That passage is repeated in the beginning of today’s Gospel lesson, which recounts our Lord walking across the lake toward them. So, why are they surprised to see our Lord commanding nature? Why haven't they gotten the message that Jesus is God, even in spite of our Lord continually showing them? And I think the answer might be a defect of our fallen nature which is shared by all of us: we resist accepting the reality of things which don’t fit our predetermined view of the world. And this can be a real hindrance in our interior life because, if there’s anything that makes a barrier to spiritual growth and union with God, it’s the inability to deal with the unexpected. I don’t think you could find a priest ordained for any length of time who will tell you that the priesthood is exactly what he thought it would be when he was in the seminary. And you can judge for yourselves how accurate was your prediction of what marriage would be like when you were engaged. Not to suggest that how it turned out is bad, but I think you’ll admit that it’s certainly different in many ways. But our ability to adjust our expectations is what enables us to persevere in these vocations. In the interior life, if our hearts are not open to accepting whatever the Lord chooses to throw our way, we run the risk of ending up bitter and frustrated and in danger of losing our faith. As a priest I see this pattern repeated in people’s lives again and again: we struggle with a particular habitual sin, or someone will be taken who was close to us, or we will find onerous some teaching of the Church obedience to which we find difficult; so, we just declare that it’s all God’s fault because we, after all, are perfect. Failure in our duties to Christ and his Church are certainly serious things, but they are not totally unexpected, which is why our Lord instituted the Sacrament of Confession. Confession would have no place in the Church were it not for the fact that a certain amount of failure is expected. What’s important is not that we never fail, but that our failures do not become occasions of bitterness and a rejection of the truth, but rather of self-examination and improvement. Sherlock Holmes, if you remember from your childhood reading, failed in his very first case. If he had simply given up detection and become an accountant instead, that would have been the last story in the series, and a pretty poor one. He chose, instead, to learn from his mistakes, and he never failed again. 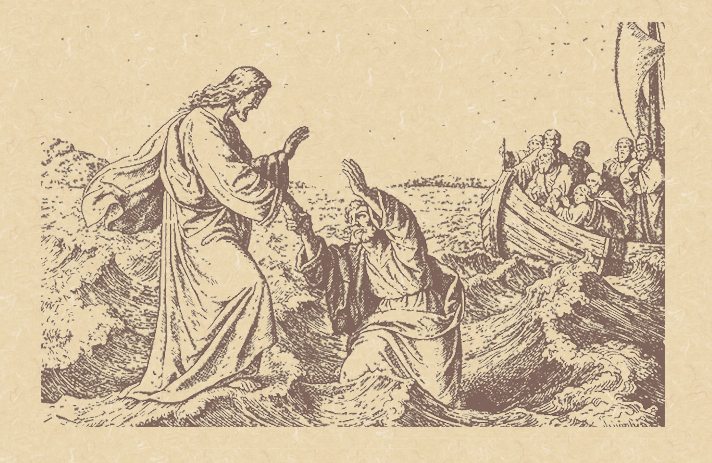 Peter, in the Gospel lesson, doubted our Lord and began to sink into the water; but, after our Lord bailed him out (no pun intended), he learned something, and made his confession of faith saying, “Truly, you are the son of God” (Matt. 14: 33 RM3). And even then, we can’t say that he never failed again, because he certainly failed when he denied our Lord three times on Good Friday. But even these repeated failures didn’t turn our Lord’s heart against him. And the Lord’s heart will never be turned against any of us, so long as we never stop trying. Maybe the Lord hasn’t dealt with us the way we thought He should. Maybe we’ve been surprised or even hurt by what we perceive to be the hand dealt to us by God. But the mind of God is not ours to know; the heart of God we know already, and knowing that can make every obligation and burden for the sake of Christ possible. * A courageous defender of the Faith against the Arian Heresy, Eusebius was tortured and exiled. He is regarded as the first bishop in the West to unite the clerical and monastic vocations, dying in 371. Born in La Mure, France, Eymard (1811-1868) became a priest in 1835 and joined the Marists in 1840. He fostered Eucharistic Adoration and founded the Priest-Adorers of the Holy Eucharist and the Priests of the Blessed Sacrament, today numbering about 900 members. In 1858 he founded the Servants of the Blessed Sacrament, a contemplative order of women. He was instrumental in establishing the custom of the International Eucharistic Congress. ** Born a Neapolitan nobleman, Liguori renounced all earthly things and established the Congregation of the Most Holy Redeemer to preach the Gospel to the poor. Known for his preaching and writing, he reluctantly accepted the bishopric of Saint Agatha in sounthern Italy, but returned to his congregation and died in 1787. Pope Saint Stephen I was beheaded just as he was finishing Holy Mass, seated on his Episcopal chair in the catacombs in 257. *** Cf. last Sunday's homily for an explanation of the Dormition Fast. St. Sephen was originally buried in a place called Kafr-Jamala, that is "Village of Gamaliel," about twenty miles from Jerusalem. In the year 415 his remains were transferred to the Holy City.